A recent accident with a projectile oxygen tank within the magnetic resonance imaging (MRI) suite resulted in a fatal injury to a small boy. This untoward and widely publicized event prompted the American College of Radiology (ACR) to form a Blue Ribbon Panel on MR Safety to develop national guidelines for improving patient safety in the MRI suite. The panel consists of academic and clinical radiologists with expertise in MR, radiology nurses and technologists, members of industry, a representative from the FDA, and ACR administrators. 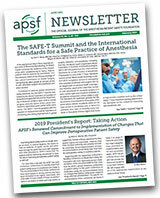 The APSF was invited to send a representative for input in the specific areas of sedation and monitoring. The following report details information needed by anesthesiologists to provide safe care within the MR Suite (see outline below for topics). Links to other locations (including the published ACR Guidelines for MR Safety) and an extensive bibliography are included at the conclusion of this article. The delivery of general anesthesia and sedation for procedures away from the operating room are considered beyond the scope of this article, although links to these topics have been included. Over the past several decades, complex imaging technology has vastly improved diagnostic capabilities but has also added a layer of complexity for safe patient care. Not only are imaging units built into fixed locations, but they often require that the surrounding areas be built to specifications that allow proper functioning of equipment and protect patients and personnel from environmental hazards. MRI is one such technology that has proven itself as being critical in defining both anatomy and function. However, several factors intrinsic to these scanners have added risk factors for patients, most notably the high magnetic field and the radiofrequency energies required for producing images. The magnet bore itself is a small enclosed tube which causes anxiety for many patients and prevents easy access in emergencies. The time required to image takes from a few minutes to hours, necessitating sedation for many patients (particularly children) and ongoing care for critical patients, so that continuous monitoring is needed. First, a powerful uniform magnetic field is created, which aligns all randomly oriented nuclei. In medical imaging, field strengths are usually 1.5 – 2 Tesla (1 T = 10,000 gauss (G)); in human research they may reach 4.0 T. The earth’s magnetic field is just under 1 G.
Radiofrequency pulses (RF) are then directed at the patient. In the presence of an external magnetic field, cell nuclei absorb more energy. “Magnetic Resonance” is created when these cells are super-energized by RF waves in a magnetic field. Nuclei recover their original alignment within the magnetic field after they have been super-energized with RF. Each tissue emits a RF signal proportional to the difference between its energized magnetic resonance state and original alignment. Tissue contrast develops as a result of different rates of realignment. The brief application of magnetic field gradients to spatially encode the RF signals emitted from the patient (time varied magnetic fields or TVMF) enables the production of 2- or 3-dimensional images. Signal readout times must be determined for each patient prior to the MRI, but after the patient is anesthetized or sedated, so that the RF signal may be recorded after initial excitation. The signal from the patient is collected by the radio frequency coil surrounding the patient and is transformed by computer into a 2- or 3-dimensional image. In general, replacing machines’ ferrous material with stainless steel, brass or aluminum can enable their placement within the imaging room. However, much of equipments’ smaller, more delicate instrumentation is ferromagnetic and subject to torque-the alignment of ferromagnetic material within a magnetic field-which can cause malfunction or serious damage to equipment. Monitoring equipment and anesthesia machines are now available and approved for use within the magnetic field. Use of ‘MRI-approved’ equipment does not preclude the need to review installation plans in advance with biomedical engineers with knowledge of the specific site. Additional concerns include the erasure of all magnetic media, such as credit cards, pass keys, floppy discs, and videotapes. Quartz driven analog watches will stop running in a magnetic field, but will resume function once outside the field. Challenges to patient care are also presented by the two large radiofrequency (RF) coils surrounding the patient. The scanning room must be shielded from outside RF interference (i.e. television transmitters, beeper paging systems, two-way radios, and commercial radio stations), which may affect RF transmission and reception. The MRI suite can be RF shielded by lining the walls and windows with thin continuous sheets of copper, and by using wave guides in the walls. In addition, any cables or leads can behave as antennae for RF and must be shielded, because RF pulses may induce electrical eddy currents short-circuiting electrical equipment or causing patient burns. Historically, MRI sites used aluminum foil to wrap cables and small copper boxes to isolate electrical equipment. MR-specific monitoring systems, besides using non ferromagnetic materials, must also isolate the equipment from RF. TVMF can induce electrical eddy currents in both biological tissue and electrical wiring. Although the biologic effects are usually minimal, very large TVMF (>10,000 T/sec) could interfere with nerve conduction, induce seizures, or cause ventricular fibrillation. For this reason, coils in any cables or leads should be avoided; however, the TVMF for currently available units is well within the range of biologic current densities (1-10 mA/m2). (Pavlicek 1988). The imaging quality produced routinely by MR, and therefore its diagnostic contribution to patient care, has made this modality standard of care for a wide variety of illnesses. Consequently, it is unacceptable to reject patients for scanning based on extremes of age, size, critical illness or inability to cooperate. Therefore, sophisticated equipment is needed for care of a wide variety of patients in the MR environment. function properly within the magnetic field (no torque on ferromagnetic circuitry).These goals can be achieved by keeping ferromagnetic equipment outside of the gauss line, by replacing ferromagnetic parts in conventional equipment with aluminum or plastic, or by purchasing equipment and monitors specifically created (and FDA approved) for use in the MR suite. Although many pulse oximeters function well in the magnet, severe burns to extremities have been caused by the induction of current within a loop of wire. This may be avoided by placing the sensor on the extremity distal to the magnet, keeping its wires free of coils, and protecting the digits with clear plastic wrap. (Brown 1993;Hughes, 1990;Shellock 1989) Alternatively, MR-specific pulse oximeters use heavy fiberoptic cables, which do not overheat and cannot be looped. The magnet superconductors are kept cool in liquid nitrogen. Should this coolant evaporate due to leaky housing (“quench”), the ambient oxygen supply of the room can drop precipitously, causing hypoxia and the potential for cryo injury. Quench monitors within each MRI suite recognize changes in room oxygen concentration. Providers should be aware of the emergency procedures in each location should a quench occur. Because of the magnet depth, nearly 2m, it is often virtually impossible to visualize the patient’s face and chest for adequacy of ventilation during scanning. Noise levels of 95 decibels-equivalent to light road work-are frequently appreciated in 1.5 T scanners, making auscultation of the lungs during scanning almost impossible. (Ear plugs are recommended for anesthetized or sedated patients for noise protection.) However, direct visualization of the airway may be possible by observing the scan. (Bell 1996;Mathru 1992) and respiratory capnography is available in both conventional systems placed beyond the gauss line and MR-compatible systems. Electrocardiographic monitoring is particularly problematic. Maximum voltage charges are induced in any column of conducting fluid (blood within the transverse aorta) when the fluid flow is 90 degrees to the field (supine patient in MR scanner). (Peden 1992) The superimposed potentials are greatest in ST segments and T waves of leads I, II, V1, V2 and increase with field strength. Also, spike artifacts that mimic R waves are often produced due to the changing magnetic fields of the imaging gradients. These changes in the ECG waveform are present to some degree even in filtered systems designed for MRI use and make it essentially impossible to reliably monitor for ischemia or to interpret arrhythmias. Plethysmography (as seen in the oximetry waveform) can be used as a heart tachometer, but is not useful for ischemia or arrhythmia detection. (Sellden 1990;Volgyesi 1991). In patients highly susceptible to ischemia, a 12-lead ECG pre- and post- MRI is recommended. If cardiac ischemia or arrhythmia is suspected during scanning, the patient should be removed from the magnet room for accurate monitoring. Several MRI-compatible ECG systems are currently available, utilizing ECG electrodes made of carbon graphite to lower resistance, eliminate ferromagnetism, and minimize RF interference. Useful for cardiac gating, these systems use coaxialized cables to avoid any coils that could result in patient burns. MR-approved monitoring systems use automated oscillometric blood pressure monitoring, which, because it is based on pneumatic principles, avoids electromagnetic interference. (Patteson 1992) For invasive blood pressure monitoring, conventional disposable transducers may function adequately outside the gauss line, but should be approved by a biomedical engineer. Disposable transducers have a predictably high natural frequency, so tubing added to distance them from the patient is unlikely to cause damping. Anesthesia machines can be modified for use in a magnetic field by replacing their ferromagnetic components to less than 2% of the total weight. (Karlik 1988) Currently, manufacturers offer MRI-compatible machines made largely of stainless steel, brass, aluminum and plastic. The position of the machine in the suite should be determined by a biomedical engineer. Vaporizers are affected little by the magnetic field and function accurately within the magnetic field. Alternatively, total intravenous anesthesia with a continuous infusion of propofol may be selected, necessitating use of infusions pumps. Commercially available computerized infusion pumps contain ferromagnetic circuitry, which can be damaged and/or malfunction in the presence of a high magnetic field. However, several pumps have been tested and found to be accurate outside the gauss line (Pope 1993) and new pumps are being developed specifically for use within the magnetic field. Regardless of the mode of anesthetic and for critical care patients, mechanical ventilation may be required. In the US, ventilators with FDA approval for use in the MR suite are primarily linked with anesthesia delivery systems. Alternatively, it is possible to convert ventilators by removing all ferromagnetic parts and then testing to assure safety and compatibility, a process that requires considerable expertise (Williams 1999). Some intensivists have been able to substantially increase the ventilator tubing using predetermined calculations to ascertain lost volume (Rotello 1994). The MR biomedical engineer must still be consulted for safe positioning of the ventilator outside of the gauss line. Plastic battery-operated laryngoscopes may be used for tracheal intubation. Batteries will last longer if shielded with a paper casing or plastic coating. Conversely, the airway can be secured using conventional laryngoscopes before the patient is moved into the scanner. Only medical gas cylinders constructed from aluminum should be used in the MRI suite. No non aluminum oxygen tanks should be brought into the secure scanner area, as multiple incidents of injury (and recently death) from projectile tanks have been reported. More commonly, small frequently used anesthetic equipment becomes projectile including forceps, scissors, pens, clipboards, stylets, etc. Not only are injuries to patients and personnel reported, but typically the scanner must be turned off in order to remove the items from the magnet bore. Resuming the magnetic field may take several days at a cost of tens of thousands of dollars. No clear mechanism for damage to biological tissue within the large static magnetic field of MRI suites has thus far been reported, likely because the human body is only weakly diamagnetic and no body functions are dependent on magnetic fields. (Ordidge JMRI, 2000) It may be that the mechanism for injury or the time required for onset of injury has not yet been established and that international multicenter studies will be needed to define the parameters of injury. (Ordidge BJR 2000) Some reversible sensory effects have been described at higher field strengths (4T and greater) including visual disturbances, nausea, vertigo and a metallic taste (Schenck 2000). Given available scientific data then, MRI seems to be intrinsically ‘safe’ for humans. The potential for significant injury is mitigated by the noise produced which can potentially cause hearing damage and more significantly by the presence of ferromagnetic biological implants or medical devices. Intrinsic to establishing a safety program for MR centers must be 1) an understanding of the risk factors for these implants and devices and 2) an effective screening program to protect patients, family members, and staff when entering the MR environment in the presence of ferromagnetic devices. (Sawyer-Glover 2000). Descriptions of screening systems are detailed by theAmerican Journal of Radiologyin the published guidelines. The MR suite differs from the operating room in several aspects. The necessity of sterility in the operating suite requires that physical barriers be established to prevent the inadvertent entrance of those not knowledgeable about operating room systems. These barriers remain active whether or not the operating rooms are actually in use. No such physical barriers have been established uniformly in the MR environment, so that in many institutions there is ready access to the hazardous environment. The ACR Guidelines have established extensive recommendations for dividing the MR suite into zones with barriers to access in those areas where the magnetic field is apparent (Zones 3 and 4). Since the magnet is always ‘on’ and gives no obvious appearance of the magnitude of the magnetic field, these barriers prevent access to the magnet without appropriate prior screening. American Society of Anesthesiologist basic standards for preanesthesia care. The official web site of the Institute for Magnetic resonance safety, education and research run by Frank Shellock, PhD. Includes database of MR tested products. A Web site developed by Dr.Emanuel Kanal, Chair of the American College of Radiology Blue Ribbon Panel on MR Safety. Includes other links. Educational products and photos of unusual projectiles. MR safe practice guidelines by the American College of Radiology. 1. Bhachu DS, Kanal E. Implantable pulse generators (pacemakers) and electrodes: safety in the magnetic resonance imaging scanner environment. J Magn Reson Imag 2000;12:201-204. 2. Bell C, Conte AH. Monitoring oxygenation and ventilation during magnetic resonance imaging: a pictorial essay. J Clin Monit 1996;2:71-4. 3. Brown TR, Goldstein B, Little J. Severe burn resulting from magnetic resonance imaging with cardiopulmonary monitoring. Am J Phys Med & Rehab 1993;72:166-7. 4. Edelman R, Kleefield J, Wentz K, Atkinson D.Edelman R, Hesselink J, ed. Basic principles of magnetic resonance imaging, in: Clinical magnetic resonance imaging. Philadelphia: W.B. Saunders, 1990. 5. Edelman R, Warach S. Magnetic resonance imaging. N Engl J Med 1993;328:708-16. 6. Edwards MB, Taylor KM, Shellock FG. Prosthetic heart valves: evaluation of magnetic field interatction, heating and artifacts at 1.5 T. J Magn Reson Imaging 2000;12:363-9. 7. Finelli DA, Rezai AR, Ruggieri PM, Tkach JA, Nyenhuis JA, Hrdlicka G, Sharan A, Gonzalez-Martinez J, Stypulkowski PH, Shellock FG. MR imaging-related heating of deep brain stimulation electrodes: in vitro study. Am J Neuroradiol 2002;23:1795-802. 8. Gangarosa RE, Minnis JE, Nobbe J, Praschan D, Genberg RW. Operational safety issues in MRI. Magn Reson Imag 1987;5:287-292. 9. Gimbel JR, Johnson D, Levine PA, Wilkoff BL. Safe performance of magnetic resonance imaging on five patients with permanent cardiac pacemakers. Pacing Clin Electrophysiol 1996;19:913-9. 10. Greatbatch W, Miller V, Shellock FG. Magnetic resonance safety testing of a newly developed fiber-optic cardiac pacing lead. J Magn Reson Imaging 2002;16:97-103. 11. Hall SC, Stevenson GW, Suresh S. Burn associated with temperature monitoring during magnetic resonance imaging. Letter. Anesthesiology 1992;76:152. 12. Ho HS. Safety of metallic implants in magnetic resonance imaging. J Magn Reson Imaging 2001;14:472-77. 13. Holshouser BA, Hinshaw DB, Shellock FG. Sedation, anesthesia, and physiologic monitoring during MR imaging: evaluation of procedures and equipment. JMRI 1993;3:553-8. 14. Hug J, Nagel E, Bornstedt A, Schnackenburg B, Oswald H, Fleck E. Coronary arterial stents: safety and artifacts during MR imaging. Radiology 2000;216:781-7. 15. Hughes CW. Anesthesia outside of the operating room. Sem in Anesth 1990;9:190-6. 16. Jorgensen NH, Messick JM, Gray J, Nugent M, Berquist TH. ASA monitoring standards and magnetic resonance imaging. Anesth Analg 1994;79:1141-7. 17. Karlik SJ, Heatherley T, Pavan F, et al. Patient anesthesia and monitoring at a 1.5-T MRI installation. Magnetic Resonance in Medicine 1988;7:210-221. 18. Koskinen MF.Edelman R, Hesselink J, ed. Site planning, in: Clinical magnetic resonance imaging. Philadelphia: W.B.Saunders, 1990. 19. Marsh ML, Sessler DI. Failure of intraoperative liquid-crystal temperature monitoring. Anesth Analg 1996;82:1102-4. 20. Mathru M, Esch O, Lang J, Herbert ME, Chaljub G, Goodacre B, vanSonnenberg E. Magnetic resonance imaging of the upper airway: effects of propofol anesthesia and nasal continuous positive airway pressure in humans. Anesthesiology 1996;84:273-9. 21. McJury M, Shellock FG. Auditory noise associated with MR procedures: a review. J Magn Reson Imaging 2000;12:37-45. 22. Menon DK, Peden CJ, Hall AS, Sargentoni J, Whitwam JG. Magnetic resonance for the anesthetist. Anaesthesia 1992;47:240-55. 23. Ordidge RJ, Fullerton G, Norris DG. MRI safety limits: is MRI safe or not?. British Journal of Radiology 2000;73:1-2. 24. Ordidge RJ, Shellock FG, Kanal E. A Y2000 Update of current safety issues related to MRI. J Magn Reson Imaging 2000;12:1. 25. Patteson SK, Chesney JT. Anesthetic management for magnetic resonance imaging: problems and solutions. Anesth Analg 1992;74:121-8. 26. Pavlicek W. Safeguarding against MRI hazards. Diag Imaging 1985;2:166. 27. Pavlicek W.Stark D, Bradley W, ed. Safety considerations, in: Magnetic resonance imaging. St Louis, MO: CV Mosby, 1988. 28. Peden CJ, Menon DK, Hall AS, Sargentoni J, Whitwam JG. Magnetic resonance for the anaesthetist, part II: anaesthesia and monitoring in MR units. Anaesthesia 1992;47:508-17. 29. Pope KS. An infusion pump that works. Letter. Anesth Analg 1993;77:645. 30. Pride GL, Kowal J, Mendelsohn D, Chason DP, Fleckenstein JL. Safety of MR scanning in patients with nonferromagnetic aneurysm clips. J Magn Reson Imag 2000;12:198-200. 31. Pruefer D, Kalden P, Schreiber W, Dahm M, Buerke M, Thelen M, Oelert H. In vitro investigation of prosthetic heart valves in magnetic resonance imaging: evaluation of potential hazards. J Heart Valve Dis 2001;10:410-4. 32. Rotello LC, Radin EJ, Jastremski MS, Craner D, Milewski A. MRI protocol for critically ill patients. American Journal of Critical Care 1994;3:187-90. 33. Sawyer-Glover AM, Shellock FG. Pre-MRI procedure screening: recommendations and safety considerations for biomedical implants and devices. J Magn Reson Imaging 2000;12:92-106. 34. Schenck JF. Safety of strong, static magnetic fields. J Magn Reson Imaging 2000;12:2-19. 35. Schueler BA, Parrish TB, Lin JC, Hammer BE, Pangrle BJ, Ritenour ER, Kucharczyk J, Truwit CL. MRI compatibility and visibility assessment of implantable medical devices. J Magn Reson Imag 1999;9:596-603. 36. Sellden H, De Chateau P, Ekman G, et al. Circulatory monitoring of children during anaesthesia in low-field magnetic resonance imaging. Acta Anaesthesiol Scand 1990;34:41-43. 37. Shellock FG. Prosthetic heart valves and annuloplasty rings: assessment of magnetic field interactions, heating , and artifacts at 1.5 Tesla. J Cardiovasc Magn Reson 2001;3:317-24. 38. Shellock FG. Radiofrequency energy-induced heating during MR procedures: a review. J Magn Reson Imag 2000;12:30-36. 39. Shellock FG, O’Neil M, Evans V, Kelly D, O’Connor M, Toay L, Crues JV. Cardiac pacemakers and implantable cardioverter defibrillators are unaffected by operation of an extremity MR imaging system. Am J Roentgenol 1999;172:165-70. 40. Shellock FG, Shellock VJ. Metallic stents: evaluation of MR imaging safety. Am J Roentgenol 1999;173:543-7. 41. Shellock FG, Shellock VJ. Vascular access ports and catheters: ex vivo testing of ferromagnetism, heating and artifacts associated with MR imaging. Magn Reson Imaging 1996;14:443-7. 42. Shellock FG, Slimp GL. Severe burn of the finger caused by using a pulse oximeter during MR imaging. AJR 1989;153:1105. 43. Sommer T, Vahihaus C, Lauck G, von Smekal A, Reinke M, Hofer U, Block W, Traber F, Schneider C, Gieseke J, Jung W, Schild H. MR Imaging and cardiac pacemakers: in vitro evaluation and in vivo studies in 51 patients at 0.5 T. Radiology 2000;215:869-879. 44. Taber KH, Hayman LA, Northrup SR, Maturi L. Vital sign changes during infant magnetic resonance examinations. JMRI 1998;8:1252-56. 45. Teissl C, Kremser C, Hochmair ES, Hochmair-Desoyer IJ. Magnetic Resonance Imaging and cochlear implants: compatibility and safety aspects. J Magn Reson Imaging 1999;9:23-38. 46. Volgyesi GA, Doyle DJ, Kucharczyk W, et al. Design and evaluation of a pneumatic pulse monitor for use during magnetic resonance imaging. J Clin Monit 1991;7:186-188. 47. Williams EJ, Jones NS, Carpenter TA, Bunch CS, Menon DK. Testing of adult and paediatric ventilators for use in a magnetic resonance imaging unit. Anaesthesia 1999;54:969-974.